Sweet potato, pumpkin, carrot, taro, BEANS, palm oil (RSPO Certified) dextrin, salt. May contain traces of PEANUTS and NUTS. Our VEGETABLE CHIPS are a feast for the eyes and a delight for the taste buds. We took all the good veggies such as sweet potatoe, pumpkin, carrot and French beans and turned them into magnificent chips. Their crunchy texture combined with a hint of salt and the best the farmer's market has to offer adds up to a sensational new snacking experience! Like walking through a farmer's market? Imagine strolling through the farmer's market at the corner and picking out the best and most colourful veggies that crosses your sight. Nice firm sweet potatoes, juicy pumpkins, delicious carrots and a handful of fresh French beans. 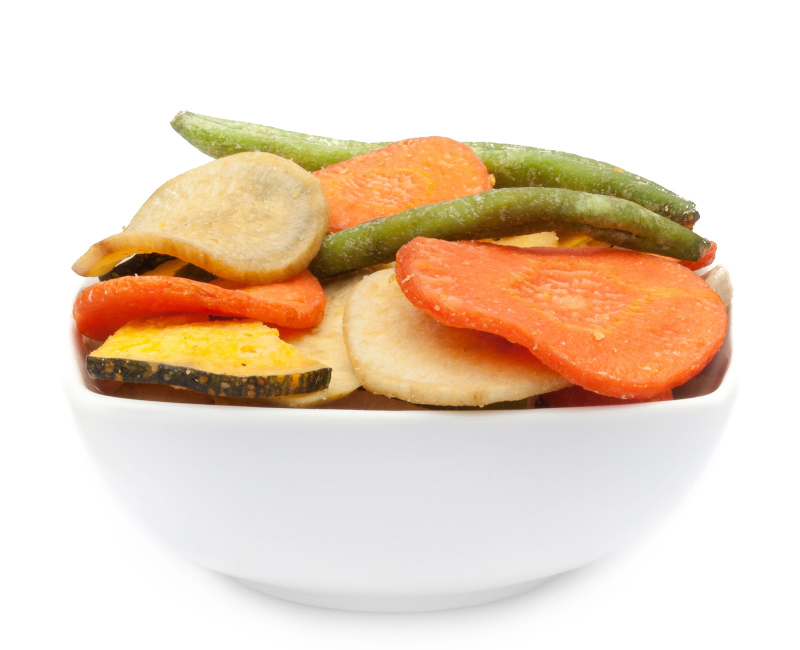 Now you already have all the ingredients for our VEGETABLE CHIPS, made out of the freshest veggies from the region. Enjoy the colourful and delicious mix we created just for you! Nowadays it's not easy to find a snack that is fun and healthy at the same time. We had the idea of gathering all tasty regional vegetables and creating a whole new mix. Our VEGETABLE CHIPS are crunchy chips made of fresh veggies such as carrots, pumpkins, sweet potatoes and French beans. Try them with a quark dip or as a topping for your vegetable soup - you will be delighted! And you will get to know vegetable from a whole new crunchy side!